WorldGuy's Walk for Diabetes Awareness -: Claims to Fame, Horses and Spires. Each town and city has something that distinguishes it as special. It may be the home or birthplace of a famous person, a site of a single event, a structure, natural beauty, an idea or an industry. Sometimes there is a sign at the edge of town, or a story told by a long time resident. 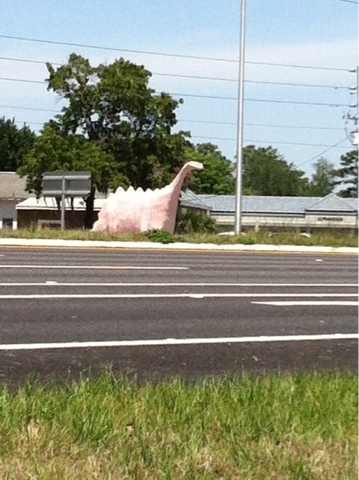 I am sitting at a quiet bench in Spring Hill, Florida that has it's giant, pink, concrete dinosaur. It was built back in the 1960's, a few years before the the gravel highway was paved. Here I am, quietly watching the wind swirl the sand and leaves here at the plaza looking back at our travels. The Frog Capitol , the Bell Capitol, the Lilly Capitol. The homes of Lindbergh, Lincoln, Thoreau, Appleseed and Edison. Everywhere has a story. 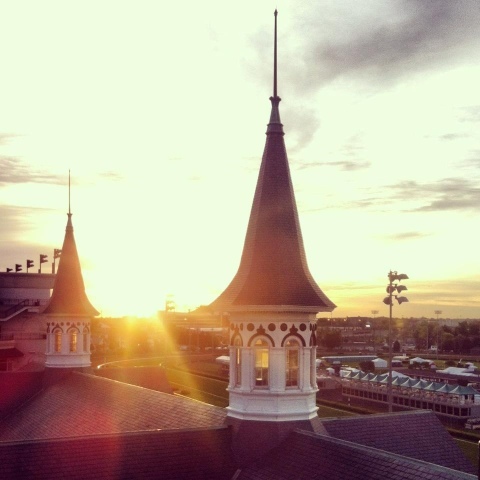 Today, the city where I have lived most of my days, Louisville in Kentucky, has a horse race at Louisville Downs with it's famous "Twin Spires". The Kentucky Derby. The first leg of The Triple Crown of Horse Racing, "The fastest two minutes in sports" brings people, high and low, from around the world. During the weeks leading up to this first Saturday in May Louisville is filled with events and gatherings, both private and public, to celebrate the 139th "Run for the Roses". This is my hometown's claim to fame. After a lifetime of Derby Festivals this bench in sunny Florida just down the highway from the little pink dinosaur that George Foxbower built will do just fine. It's your hometown, but it's an event I dream of seeing in person one day! The Kentucky Derby! !